Circuses got it all right except for clowns. Smiling doesn’t always indicate happiness and the red nosed circus performers always seem to stare a little too intently. 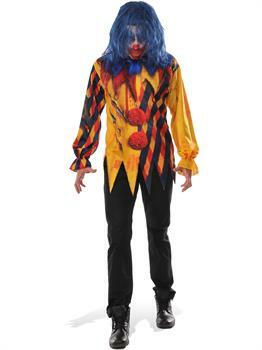 Put others on edge this Halloween in the Killer Clown Shirt costume. Borrowing cues from Elizabethan era jesters this shirt offers plenty of details. A bell tipped collar, red buttons and cuffed sleeves look fine and well but not all the red is part of the design. Slashed fabric and blood stains can be seen too. Buy the Killer Clown dentures and Ronald McDonald style wig to intensify the off-putting look. Don’t let this simplified costume deal take its act to the next town by purchasing your shirt now!